In response to popular demand, the Real ITSM Wright Cycle is available now on shirts and mugs. The perfect ITSM conversation piece. Prohibit continual improvement. Once a system is barely adequate, leave it alone. Its life expectancy is short so why invest in optimising something that will be torn down soon enough? Any Real change that does happen is to be based on the Wright Cycle of Guess-Do-Crash-Fix (named for the Wright Brothers, who crashed many an airplane before they got one off the ground.). 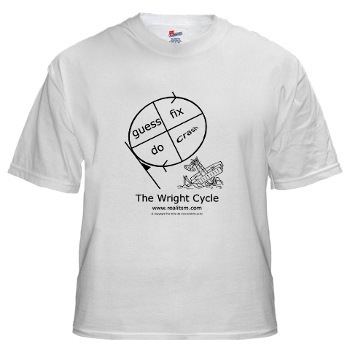 Now you can display the Wright Cycle diagram on your shirt or coffee mug so that you may conveniently explain it as required. In order to further stimulate conversation we have arranged the quadrants not as originally shown in the book, and not as the Deming Cycle is almost always erroneously arranged, but in the correct logical order as they would pass when rolling. Liven up ITSM with the Wright Cycle today. Submitted by skeptic on Wed, 2009-04-22 10:21.
there is a story that Neil Young only played guitar and never sang because he was too embarrassed about his voice, until one day he heard Bob Dylan. I felt the same way about my drawing [skills] when I saw Scott Adams’ Dilbert. Unfortunately, Neil Young sings better than I draw. Submitted by kengon on Mon, 2009-04-20 19:01. So exactly how does this (not) work? Submitted by skeptic on Mon, 2009-04-20 20:43.